American Pharoah won the American Triple Crown in 2015. He is bred and owned by Ahmed Zayat of Zayat Stables, LLC, trained by Bob Baffert and ridden in most of his races by Victor Espinoza. He is the first American Triple Crown winner since Affirmed in 1978 and only the twelfth in history. American Pharoah won the 2015 Kentucky Derby and 2015 Preakness Stakes. He won the Triple Crown in a wire-to-wire victory at the Belmont Stakes with his time the second-fastest for a Triple Crown winner and his closing quarter-mile time of 24.32 was actually faster than Secretariat's. 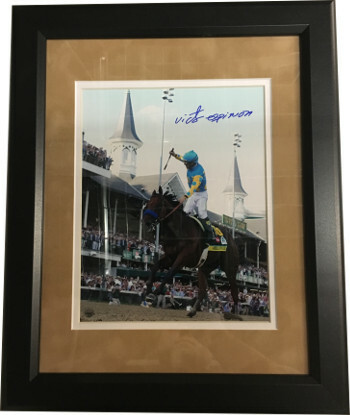 Victor Espinoza has hand signed this 8X10 Photo on American Pharoah from the Kentucky Derby. Steiner Sports Hologram and Certificate of Authenticity. Custom Seude Mat and Premium Black Frame as shown.